When I was young and curious, though uninhibited and unaware that I might offend anyone with my inquiries, I would often ask, Why do people watch baseball? Why do people like soccer? Why do people play video games? I didn’t see why anyone would invest themselves in interests that seemed to depend wholly upon an arbitrary circumstance, a situation of personal whim, without reason, based on no prior system. It all seemed frivolous. At age 6, I had a lot of opinions. And it wasn’t that I was apathetic, no. I loved (still love) tennis, and will always love reading, and the certain sense of wonder and possibility I’ve always associated with entering a library. But these loves felt innate, something again that I couldn’t explain. Then I grew up, and I started to wonder if this is what other people felt as well. Since then, I’ve repositioned how I approach passions, realizing that different things in the world attract different people. And within these groups of interest is where most find their community, the people whose view of the world reflects a bit of their own. Walking into Leeward Surf, I felt this immediately. Though it’s after hours, and only the owner, Lyndsey and I occupy the space, there’s something palpable about the feeling of fellowship that moves through the walls. It’s a result of common attitudes, common goals, and a common interest: surfing. This seems indicative of the Portland I’ve discovered. People are curious about you, wanting to know what interests you, what energizes you, and they want to support this. It’s this engagement and stake in each other’s lives that breeds affinity and comfort, and that pulls and makes us feel a part of Portland’s diverse, collective whole. Though Portland’s surf culture is newly-organized, surfers have been living here forever. It wasn’t until recently that its existence became pronounced. Lyndsey comments on this, noting an interesting parallel. There’s a certain amount of wonder that comes with discovering something else, something apart from what all previous experience led you to before. It was when Lyndsey moved to Portland that she was starting to learn about design, and really dig into music. She moved here to work for a record label, entering into a world that felt different, that felt new held up against what she had previously known. Lyndsey talks about the seeming disparity between surfing and art, and the seeming happenstance that made her fall in love with both. But looking around the store, and listening to her story, I see something else. Lyndsey’s blending of surfing and art reveals something, showing me that sometimes, you become passionate about something when you connect it to something you already love. There’s a certain amount of wonder that comes with discovering something else, something apart from what all previous experience led you to before. But, as with everything you love, you start to miss it, and you come back to it, though with this new context, this new understanding of what it can be. I pause with this, thinking about what I love, what makes me excited, what pushes me and makes me work. And I see that upon first glance, the spread of interests doesn’t align. But we’re dynamic, in constant shift and flux with how we see and know ourselves. Upon reflection, a path in our journeys can always be tracked, no matter how many detours we take along the way. It all culminates in experience, and it all informs what we love today. At Leeward, this sense of diversity and inclusion of interest is widely-felt. 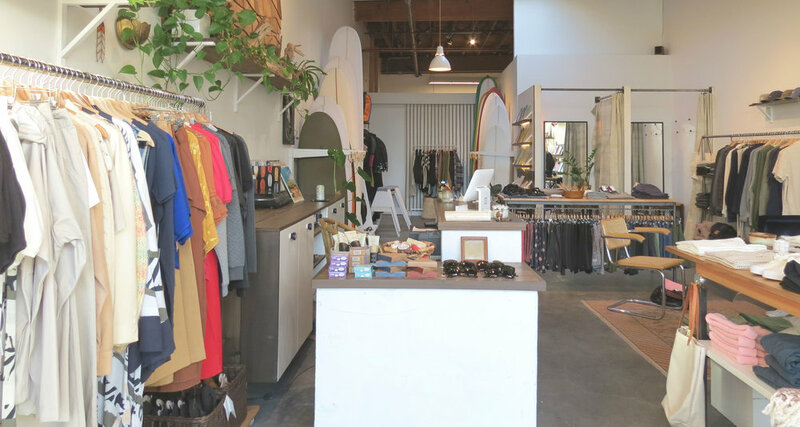 The shop departs from what is conventionally known as surf culture. An artful array of boards lines several walls, and macrame encapsulates vibrant flora, suspending the lush greenery above the floor. There’s no sight of the brands that omnipresently stretch across surfer tees and board shorts. Instead, a rack of vintage hangs in its multicolored glory and idiosyncratic sketches illustrate a table of shirts folded neatly on a central table. A path in our journeys can always be tracked, no matter how many detours we take along the way. It all culminates in experience, and it all informs what we love today. The space offers an all-embracing gesture, nodding at what Lyndsey has, maybe unknowingly, set as precedent: a belief, and even more so, a conviction that everything, when loved and followed in a pursuit of passion, is creative. And because of that, maybe design and surfing aren’t so dissimilar. All aesthetic interests can serve as a backdrop of representation for anything you’d like, anything you want to give voice and offer to others. I see the element of community somewhere else: in Leeward’s beginnings. Though Lyndsey had come up with enough money to buy inventory, there was a significant gap standing between her and building the store. And so she used Kickstarter, the world’s largest funding platform for creative projects, to make up the difference. Lyndsey says this, and it makes sense right away. I’ve always loved Kickstarter for the initiative’s ingrained notion of support. It gathers people around your idea, standing up for and encouraging what you want to create. I leave Leeward with an optimistic spin of possibility moving through me. From my conversation with Lyndsey, I see the freedom that art and design provide for each of us. Creativity implies a start, suggesting a way of thinking that connects feeling and observance to an opportunity for building, encouraging the growth of something that we want to exist as a way to connect us to others, and to bring us closer to ourselves.